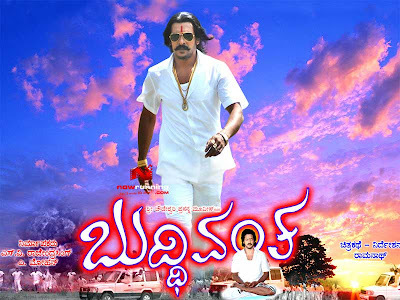 Upendra's films evokes lot of curiosity when released. In the latest case, the new release Buddhivantha entertains you only in patches and will be more liked by his fans for Uppi's dialogues and mannerisms. Buddhivantha is a story of man who cheats 5 women under various disguises as Vijay Mittal, Shree Ranjaneesh, Samara Simha Reddy, Zakir Hussein and Shyam. Joseph Fernandes or Panchamrutham (again disguising himself) projects himself as a business man, a divine person, a macho man, a painter and a personal secretary to win hearts and later cheat them. When he is caught and produced before the court, he tells his name as Panchamrutham and denies all the allegations by the 5 ladies saying he is none of the 5 men mentioned or rather asks them to prove his misdeeds if he was one. The court hall becomes witness only for the sorrow stories of these women and not for the evidences to prove that. 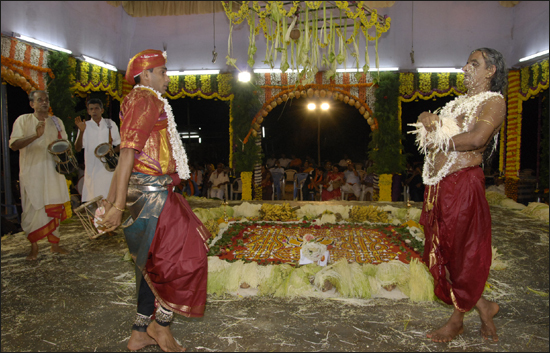 The court acquits Panchamrutham due to lack of evidence. Why the hero dons many roles to cheat the 5 women is revealed by him at the end of the film. Though Upendra plays in different roles in the film, only few will be in mind even after the show. As Panchamrutham he speaks Kannada with coastal Karnataka flavour in the court putting logic behind his every argument in the court. Samara Simha Reddy reminds you of the Telugu film hero with all 'extra' special effects for stunts and soon puts you into laughter mode. Krish and Dhoom2 spoof scences by Upendra, here add to the comedy. Talking of songs, I did not find any song worth listening again. Lyrics is horrible compared to class lyrics found in Kannada cinema nowadays with not only Jayanth Kaykini but other lyricists putting effort in composing good songs. Ravivarmana remix song could have been made better - more importantly it is not bearable to hear 'Kalle' and 'Bhalle' instead of Kale and Bhale in the line 'Ravivarmana Kunchada Kale Bhale Saakaaravo'. The mispronounciation continues in Chithranaa song where it is pronounced as 'Chithraanna' instead of Chithranaa in the pallavi of the song. To the folks who still think it as Chithraanna here is the correct lyrics - 'Chithranaa Chithranaa, Neene Nanna Manasina Chithranaa'. Chidaanand (Pa Pa Paandu fame) appears for a brief moment in the film as friend of Upendra. Also after a long time, Lakshmi is seen in a supporting role as judge and mother of Pooja Gandhi. Another long forgotten face on the silver screen is veteran actor Shridhar who had done lot of films with yester year queen of Kannada cinema, Maalaashree. Out of the 5 heroines only Pooja Gandhi and Suman Ranganath shine. Film is just a time pass and can be avoided if you think only dialogues do not make up a good film. this would be a comeback film for Uppi just like Kutumba some time back.